I wanna to convert my downloaded YouTube videos to my new iPhone 8 for offline playback. Is there any suitable YouTube to iPhone converter Mac for recommendation? With technology developing day by day, TV is not as hot as it used to be, instead, people are now spending more time in front of YouTube that provides tons of new and interesting clips to watch without region restriction. In spite of such wonderful video sharing website, video lovers still expect to find a way to get videos off YouTube. So it's not surprising that the YouTube conversion finds its way to the mobile world, where iPhone 8, one of the main entertainment gadgets, ranks first among the mobile devices as YouTube video viewing platform. For windows users, it's really a piece of cake to get YouTube to iPhone decoding and encoding done, while for Mac users, downloading and converting YouTube videos to iPhone may sound far more difficult than the former. If you read on, you may now have the golden fleece - MacX Video Converter Pro , which is the best YouTube to iPhone converter for Mac users. This professional Mac video converter works well in downloading YouTube videos and converting to iPhone 8/Plus compatible format like MP4/MOV/M4V on macOS High Sierra or eariler OS with ease. Just a few clicks, you can make YouTube video playable on your iPhone 8/Plus/7s/7/6s/6/SE/5s anytime anywhere without buffering. World's fatest YouTube video converter can easily download YouTube HD/4K UHD videos and convert YouTube videos to iPhone 8/8 Plus/7s/7/6s/6/SE etc with excellent quality. Download and run this YouTube to iPhone converter for Mac, directly click "YouTube" button instead of downloading the YouTube video on Mac computer, copy and paste the YouTube video URL to the type box before clicking "OK", then the rest YouTube downloading job can be done automatically with this Mac YouTube to iPhone converter. Step 2: Choose Output Format on Your Mac. Since you are eager to convert YouTube video to iPhone on Mac, you can either choose "to iPhone" or "to MP4" as the output format. This YouTube to iPhone converter for Mac also supports converting YouTube videos to the latest generation Apple iPhone, namely iPhone 8. Besides, this program also boasts a feature of downloading YouTube to iPad, iPod, MP4, MOV, MP3, etc. Click the "RUN" button to start conversion with this YouTube video converter for iPad. The super video conversion speed will help you get the wanted videos within the shortest time. You can view the whole progress and are able to cancel it at anytime. 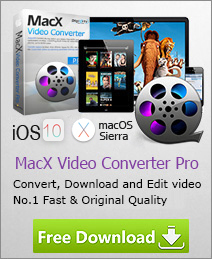 Besides serving as a professional YouTube to iPhone converter, this video converter for Mac also works well in converting between more SD videos and HD videos like MOD, MP4, MOV, FLV, AVI, MTS, AVCHD, etc to be playable on various mobile devices, thus allowing audience to choose output formats whatever they want. 3. Get a better video experience due to iPhone's generous retina screen once converting video from YouTube to iPhone. To download YouTube video for offline playback on iPhone 8/Plus is now available to you. 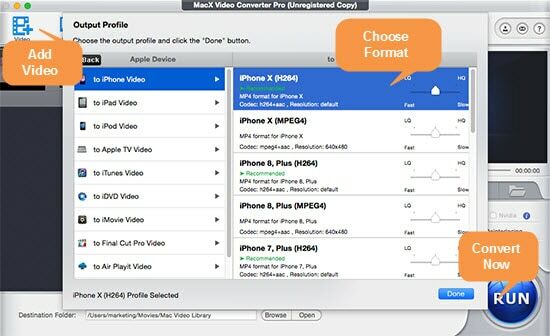 Simply download MacX Video Converter Pro and then you can fast convert YouTube video to iPhone 8 compatible format for unlimited playback with highest quality. Anyone eager to download 4K video to iPhone 8 can stay on the guide. MacX Video Converter Pro is the optional choice to download Ultra HD video from YouTube at fast speed and convert 4K UHD video to iPhone 8 format with maximum quality reserved. Best HD to iPhone 8 Video Converter: guide you to convert HD MKV to iPhone 8, as well as HD MTS, AVCHD, AVI, FLV to iPhone 8 with zero quality loss just a click away.